Thomas T. Martinez Jr. obituary. Carnes Funeral Home. Thomas T. Martinez Jr. was born December 17, 1952 in San Antonio, Texas. He was a forty year resident of Texas City. He was retired From Amoco Gas Company and is a member of the Texas City Masonic Lodge. Thomas left this world on August 22, 2013 at 8 o’clock in the evening. Thomas is preceded in death by his father, Thomas L. (Tiger) Martinez, son, Mark Anthony Martinez and mother-in-law, Leonor Paniagua. 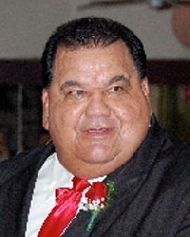 Thomas was survived by his loving wife, Leonor O. Martinez; son, Thomas T, Martinez III and his wife Whitney; grandson, Keegan; mother Irene T. Martinez; siblings, Irma Linda Gonzales, Angie Martinez, Sanjuanita Muth and Mark Anthony Martinez; brother-in-laws, Abel Gonzales and Joe Muth; sister-in-law, Nora Martinez; nephews, Joey Muth (Godson), Mario Arrendondo, Nick Arrendondo and Mark Anthony Martinez II (Godson) and Mark Anthony Liedecke; nieces, Veronica Arrendondo, Alexis Gonzales, Robyn Martinez and Megan Martinez; great nephew, Isaac Rubio; great nieces, Apple Muth, Alyssa Arredondo, Audie Rubio and Ariel Rubio; long time friends, Andrew and Ron as well as numerous other family and friends. Funeral Services will be held at Carnes Funeral Home - Texas City on August 27, 2013 starting at 9 a.m. Interment to follow at Forest Park - East Cemetery. We were all fortunate to have known Thomas and experience the love, laughter and kindness that his spirit possessed.